For shops that aren't already using it, 5-axis can seem pretty intimidating. In the early days, this reputation was justified. But Errol Burrell, Machining Center Product Specialist for Okuma, says, "not anymore." Twenty years ago, running 5-axis was very hard to do, and a lot of work. There was a lot of math involved for the user. Today, anyone in a machine shop who is already doing 3-axis machining can make the leap to 5-axis within a couple days -- it's that simple. All you need is one line of code, and you're doing simultaneous 5-axis. This means today we're seeing a lot of interest in 5-axis machines across the board. When considering a new machine, one has to think about the costs of sticking with older technology. Shops are realizing, if they don't have 5-axis, they can't remain competitive in terms of cost per part. For example, let's consider a shop that's making a part using a traditional 3-axis process. This often involves 5 or 6 setups. You do the first operation, then move the part, do the next operation, and so on. Of course, you need a skilled operator to perform all these operations. Plus, every time you move the part, you increase your chances for error. By moving to a 5-axis machine, you greatly reduce the number of operations, often down to one or two setups. Now you're reducing time, reducing chances for error, and reducing your costs. Plus, your operator skill level will not need to be as high. The impact of 5-axis can be quite dramatic, and we've seen shops that have been able to grow very quickly after adding this capability. One shop we know on the West Coast, they used to be just a small job shop. They got into 5-axis five years ago, and now they're building a second shop. Their transition to 5-axis enabled them to bring in different types of work that were much more profitable. This was work they never could have quoted with their older machine. This has allowed them to expand quite rapidly. Because of the growing popularity of 5-axis, builders in our industry have focused on meeting this demand. Some have placed a focus on driving down costs, so shops could get into what might be called an "entry level" machine with as little sticker shock as possible. 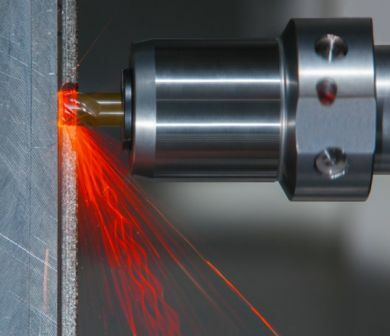 This has not always resulted in the best quality machine tool technology. At Okuma we've taken a different approach to building our most affordable 5-axis machine. First, we haven't compromised on design quality in any way. On our new GENOS M460V-5AX, we use the same design we use for all our5-axis machines. Included are the 15k spindle, the heavier machine mass (18,000 lbs. ), 32 tools, and productivity-enhancing technologies such as Super-NURBS and Thermo-Friendly Concept. Where we have created cost efficiencies is by offering one basic, standard package, with just the options that will be the most suitable for most shops. 5-axis machining is my specialty, and something I'm very passionate about. So it's exciting to see so many shops stepping up to this technology. These days, 5-axis is not a luxury, it's a must-have. The good news is the transition to 5-axis is usually quick, easy and pain-free. The days of being intimidated by this technology are over. Truth is, there's never been a better time to move up to 5-axis machining.